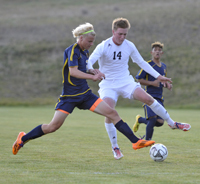 Community School boys’ varsity soccer coach Richard Whitelaw called it a “top of the table” match-up when his Cutthroats and the Wendell Trojans clashed for the first time this season Monday night at Browning Field in Elkhorn. When the final whistle sounded in near-darkness, the resurgent Cutthroats (7-3-0, 5-1-0 for 15 points) stayed atop the crowded High Desert Soccer Conference table despite their 2-1 loss to coach Jonathan Goss’ talented Trojans (4-0-2 for 14 points). After the first swing around the High Desert slate, the Cutthroats stand one point ahead of second-place Wendell, with two-time defending league king Gooding (4-2-2, 4-1-1, 13 points) right behind and pesky Buhl (4-3-2, 3-2-1, 10 points) looming in fourth place. Wendell’s 2-2 home ties with Gooding and Buhl in its first two games of the season has kept the Trojans out of first place despite Monday’s win. Yet the Cutthroats, losers three straight times to Wendell 2-0, 4-1 and 6-1 last season, had the better scoring chances Monday and never stopped pressing the attack. Whitelaw said afterward, “It was easily the most exciting and complete game of the season, in front of the biggest crowd and in darkness. Trojan senior attacker Jose Alfredo Barajas found an open spot with fancy footwork and fired a left-footed arrow from just outside the box in the 71st minute—breaking a hard-fought 1-1 tie and giving Wendell the league triumph. It wasn’t the first time Barajas gave the Cutthroats problems. His speed caused a Cutthroat foul in the box and gave Wendell senior Jorge Valera what became a successful penalty kick in the 12th minute. Yet the Cutthroats equalized in the 39th minute after a fine Tom Gillespie pass found Dehner Figge in the box. Figge’s scoring bid was saved by Wendell keeper Daniel Cruz Ortiz (12 saves). Lurking was leading Cutthroat scorer Jay Fitzgerald, who collected the rebound and nestled the ball in the top of the Trojan net for his 17th goal—the ninth time in 10 games he has scored at least one goal. “Man of the Match” was junior Henry Everitt. He nearly put the Cutthroats ahead just after halftime with a header that went wide, after a Roger Figge corner kick. And the Cutthroats had other tantalizing chances that just didn’t find the net Monday. Senior Jack Swanson anchored the Sun Valley defense in front of senior goalkeeper Willis Sanchez-Dupont (7 saves). Shots (13-12 Wendell) and free kicks (9-8 Wendell) were even. The Cutthroats had a 4-1 edge in corner kicks. For the Cutthroat boys, it was their first meeting with Wendell since falling 6-1 to the Trojans in the 2013 State 3A tourney consolation game. Wendell (30-8-5 three years) has won the state consolation title the last two years. Saturday, the Cutthroats dropped a 2-1 non-conference game to the 4A Burley Bobcats (2-4-0) on the turf football field at Burley. Fitzgerald provided the Cutthroat goal. “Man of the Match” was Dehner Figge. Captain Jack Swanson made his 50th varsity start for the Cutthroats. The Cutthroats host Buhl today, Wednesday at 6:15 p.m. and then are off for 10 days for the annual school fall trips. Whitelaw’s squad kicked off a string of five straight league wins 4-0 at Buhl Aug. 25. The league-leading Cutthroat girls (6-2-0, 6-0-0 league) finished the first half of the High Desert fall schedule with their fourth consecutive league shutout win Monday, 8-0 at home over Wendell (1-5-0). Leading scorer Ella Viesturs (11 goals) had four goals for the winners and “Player of the Game” Grace Pepin added two. Singles came from Josie Allison and Kate Rathfon. The Cutthroats (18 points) entertain fifth-place Buhl (3-6-0, 2-4-0 for 6 points) today, Wednesday at 4:30 p.m. on the Sagewillow Farms pitch.